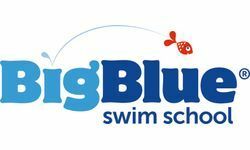 Big Blue Swim School focuses on creating Big Moments for children ages six months to 12 years old. In purpose-built facilities designed to create a safe, welcoming environment for families, their teachers work with kids to develop swim skills that include stroke, breath, and propulsion, creating confident swimmers and building important life skills like courage, hard work, and perseverance. Big Blue Swim School focuses on creating Big Moments for children ages six months to 12 years old. In purpose-built facilities designed to create a safe, welcoming environment for families, their teachers work with kids to develop swim skills that include stroke, breath, and propulsion, creating confident swimmers and building important life skills like courage, hard work, and perseverance. Their lessons encourage children to face their fears and build self-assurance – giving students the tools they’ll need to face life’s challenges through childhood into adulthood. Trained under their proprietary teacher-training program, Big Blue’s instructors strive to lead every student to a Big Moment during every class, while teachers, managers, and parents work together to focus on each child’s progress. Lesson Buddy, the company’s robust back-end office support and proprietary software – designed and developed for the ease of the owner, staff, parents, children, and facility – allows families to easily follow that progress and connect with teachers and Big Blue staff. An attractive, scalable franchising opportunity, Big Blue was founded by former competitive swimmers John Lonergan and Chris DeJong. It’s being financed by Level 5 Capital Partners, founded in 2009 by Fortune 1000 technology executives and dedicated to backing exceptional entrepreneurs in the health, wellness, and family markets.